UFC bantamweight champion T.J. Dillashaw worked so hard to cut down the necessary weight to make the flyweight limit. His goal was to move down to 125-pound to beat division’s champ Henry Cejudo and become a double champ-champ at UFC Brooklyn however his dream got crushed in 32 seconds of the round one. Early in the fight, Cejudo wobbled Dillashaw with a head kick then dropped him to the mat. From there Cejudo went killer mode and landed series of clean punches. Dillashaw tried his best to recover, but referee Kevin MacDonald stepped and prevent bantamweight champion from further damage. Despite he already suffered a loss, but TJ Dillashaw is angry with the early stoppage. Dillashaw trying to come to terms with his loss, but anger is still simmering inside him about Saturday night’s disaster. “Well F*#% that didn’t go as planned. Sorry to all my fans that I didn’t get to show all my hard work. Tough one to swallow having the fight taken from me like that. 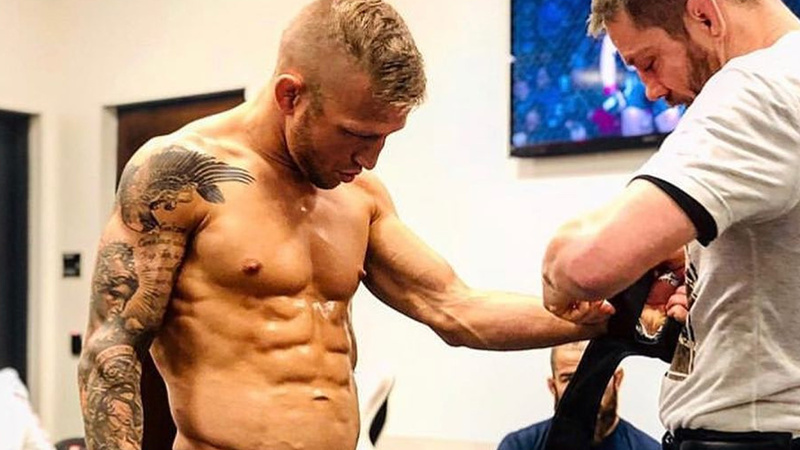 But I need to lead by example for my son and practice what I preach, brush my self off and pray that I get the chance to do it again,” Dillashaw posted on Instagram. At UFC On ESPN+1 post-fight presser Dillashaw demands an immediate rematch at flyweight, it’s highly unlikely that the Dana white will grant his request. Even Cejudo said he isn’t interested in a rematch at 125-pound but did tell bantamweight champ that he would be happy to rematch Dillashaw for the 135-pound title.